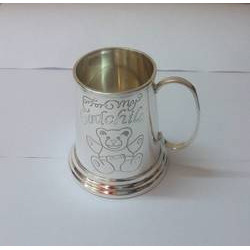 we are manufacturer and exporter of STERLING SILVER and SILVER PLATED BABY CUPS, CHILD CANS, BABY MUGS. We have many designs of cups in different sizes and shapes. Cups can also be made as per buyer's specifications and designs. 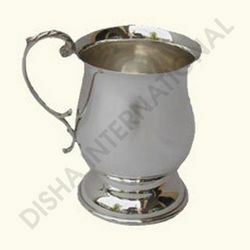 we manufacture these cups with 92.5% purity silver with international quality and finish. Backed by state–of-the art manufacturing process we are manufacturing, exporting and supplying a wide range of Sterling Silver Baby Cup. Our offered baby cups are manufactured using supreme grade silver and cutting edge technology. These baby cups are highly suitable for gifting purpose. In addition to this, provided baby cups are passed through different quality tests by our in house quality experts so as to maintain their quality. We are offering customized products. This Georgian pattern sterling silver baby cup is a life long present from parents or grand parents to their love ones. We have a range of Sterling Silver baby cups in different weights and sizes to suit every requirement. We prefer to produce the Silver baby cups as per buyer’s designs and specifications for exclusivity. They are not only beautifully handcrafted to perfection but high polished and lustrous. These cups are engravable and can feature monograms, initials or a custom message. We are offering customized products. We are the leading manufacturer, exporter and supplier of a wide range assortment of Silver Baby Cup. Our provided cups are using made up of great quality silver and sophisticated technology by our experts. We offer these cups which are available in several sizes and also varied customizations. Our cups are widely in demand for its fine quality and smooth finish. Moreover, these cups are tested on well define parameters of quality in order to deliver defect free cups at clients end. We are offering customized products. Our company has carved a distinct niche in the industry for manufacturing, exporting and supplying an exclusive range of Silver Baby Cup. Our provided cups are highly admired by our clients for their various specifications. 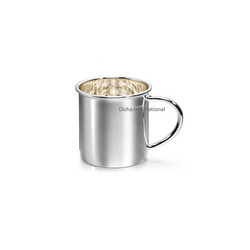 The offered cups are manufactured by our brilliant professionals employing advanced tools and techniques with the aid of the best quality silver. Moreover, we provide these cups to our clients at pocket friendly rates. We are offering customized products.